St. Petersburg is a city of layers with each layer corresponding to a different historical era and and each visible in the architecture and various sights around town. The first is the classical layer which can be seen in the ornate architecture of the city built by Peter the Great. Many visitors assume that it is classical Russian architecture, but our guide reminded us that St. Petersburg was built as a European city, not a Russian one. It is this layer that most attracts visitors. The second layer is that of the Soviet era, during which the city was named Leningrad. Vestiges of that era can be seen in the giant, nondescript apartment blocks that dominate the outer areas of the city. Seeing these giant housing blocks was quite disorienting since they looked exactly like the thousands of apartment buildings that are commonplace in Chinese cities. As soon as we got out of the center of town — the old city — I felt like we could have been in Beijing (minus the crowds, mind you). In fact the photo above looks a lot like my old neighborhood in Beijing. The Soviet era is also visible in the subway system, with its ornate Stalinist art extolling the virtues of the working class. The third, and most recent layer of St. Petersburg is that of the post-Communist era, characterized by traffic jams, shopping malls, and gleaming skyscrapers. During World War II, Hitler ordered his army to capture and destroy the city. Although it was under siege for 900 days, they were never able to take it. It is estimated that more than 1 million of the city’s inhabitants died, either of starvation and disease or during the frequent bombardments. 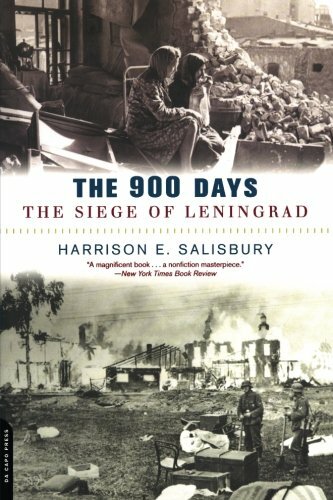 An excellent book about the siege is The 900 Days: The Siege Of Leningrad, by Harrison Salisbury.